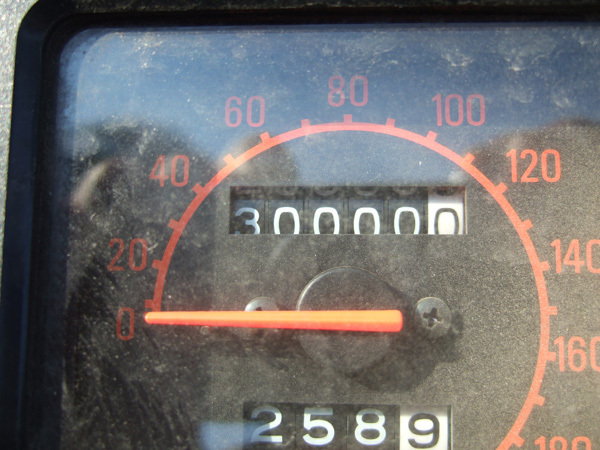 I crossed the 30,000 km milestone on my way to Ottawa on Monday. 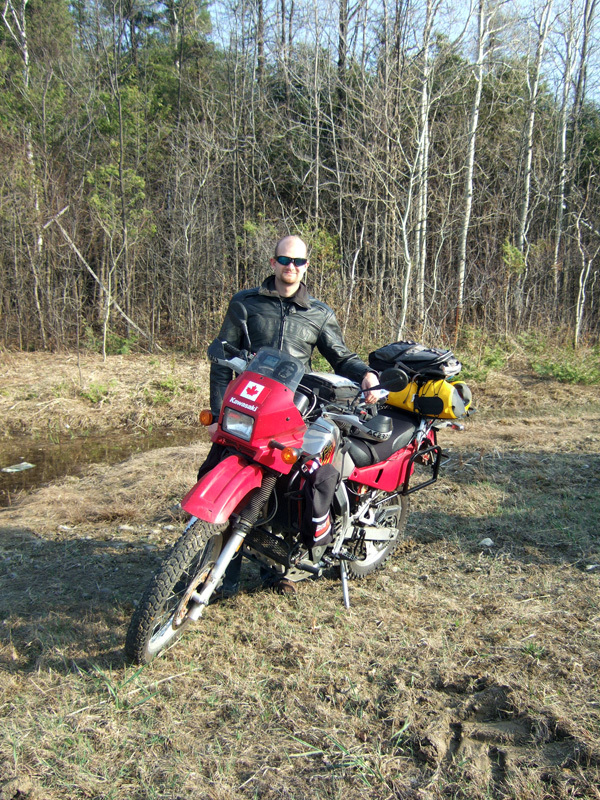 I pulled off the 401 and rode into the mud for a photo op. When I hit the 10,000 km milestone I was in Mexico, just north of Guadalajara. I crossed 20,000 kms in the Peruvian desert. I imagine I will be somewhere in North Africa when I hit the 40,000 milestone. Jeremy and I have ridden about 3,000 km in the last few days largely for the purpose of trip preparation. We rode down to Chicago on Friday, ostensibly to pick up supplies that we had had shipped to Derm’s place (Derm is now doing his PhD at Northwestern). But it also gave me a chance to visit an old friend, Adam, who I first met when we were both selected for the Tropical Neuroethology Program in Puerto Rico in 1999. We had roomed together in the Institute of Neurobiology in old San Juan. 9 years later, we are both still students. Who would have thought. Adam is finishing his PhD in Neuroscience at Northwestern. It was good to see Adam and Derm again, and the four of us had a good night on the town on Friday night. We ended the night at a great bar on Ashland called Tai’s til 4. I highly recommend it. On Saturday we hit another couple of bars with an excellent selection of beer. At the Hopleaf, we tried Raison d’Extra from Dogfish Head, which has an alcohol content of 20%. One of the main items that had had shipped to Derm’s was supposed to be two SU racks from Happy Trails. We ordered them in the hope that they will hold up better than the Caribou rack that disintegrated during my trip to South America. Unfortunately, only one rack arrived in Chicago, even though I was charged for two. When informed of the mistake, Happy Trails immediately offered to ship the second rack directly to Toronto. Still, we rode back to Canada with a good collection of newly acquired electronics and spare parts. We ended up leaving Chicago late in the afternoon on Sunday. By the time we got back to Toronto, it was after 3 AM. Nonetheless, we got up the next day and headed for Ottawa. Jeremy and I had a lot of embassy hoping to do in order to get visas for the Middle East and Africa. We ended up getting visas for Ethiopia and Egypt quite easily. We will have the Syrian visa mailed to us shortly. How we are going to get a visa for Sudan in the time remaining before we leave I do not know. While in Ottawa, we stayed at Adam and Kristina’s place. They had exciting news. Yes, after much speculation on the timing, Adam and Kristina are now engaged. The wedding is planned for sometime in October. I was told that I had better survive Africa – especially since I was asked to be the best man. I certainly intend to be there for that. Congratulations Adam and Tina.